I have been meaning to get around to doing this. It's the sort of thing I know I like to know about people. You can tell a lot about a person by what they read- or what they don't read, as to that. Anyway: the first three are easy to assemble for several reasons, not the least of which being I actually know where I put them away when I was last finished with them. The last two books are less easy to cull from the literary ranks in my house. Well! I will be honest, if a little narrow-minded, in my selection. 1. 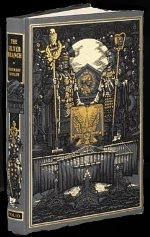 The Silver Branch by Rosemary Sutcliff. "When they accidentally uncover a plot against the British emperor Carausius, a young army surgeon and his soldier cousin are caught up in a maze of intrigue that leads them first to exile at a distant outpost and finally into an underground organization of secret agents in the service of Rome." Can it get any better than this? Jenny doubts it. For years Justin and Flavius have been the best companions in literature I've ever wanted. 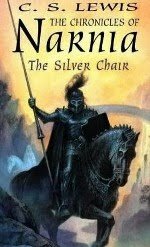 Added to Sutcliff's natural ability to bring Roman-Britain to life with her wide spaces of forbidding Scottish moorland and her magical, brief glimpses of dawn by the sea, ginger-headed Flavius and shy, stuttering Justin give this historical fictional all the pulsing life it could ever need. I could go on. I could go on and on. I could give the whole plot away, but suffice it to say that I have yet to encounter such a vivid combination of tatterdemalion yet fitting figures in a story so charged with vitality, simply, yet elegant, and worthy of being read to tatters. A strange bus-ride of Ghosts from Hell to visit Heaven. Written today, written by anyone else, it might come off as presumptuous. Who dares write on Heaven - or even Hell, for that matter? But Lewis isn't so much writing on them, as about them. You'll all be familiar with the phrase "The Kingdom of Heaven is like..." In a way, Lewis' approach is very like that with his discourses between the Ghosts and the Bright People. I find myself kicking myself over and over as I read this book, wondering why Lewis could see the profoundly obvious, and why I was too dumb to see it myself without his help. But still, I like to hear him say it. "What do you keep on arguing for? I'm only telling you the sort of chap I am. I only want my rights. I'm not asking for anybody's bleeding charity." "Then do. At once. Ask for the Bleeding Charity. Everything here is for the asking and nothing can be bought." "Say wha...? Jenny, it's a kid's book!" Nope, wrong. That's what Carol Kendall thought when she wrote it. She was wrong too. Sorry. 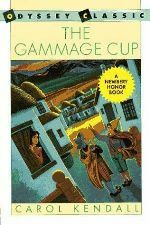 The Gammage Cup ranks up there with Winnie-the-Pooh in its ageless beauty. This book makes me laugh, it makes me cry, it makes me wonder in amazement at how sophisticated, and yet how unassuming it is. Minnipins! Minnipins arguing over the colours of cloaks and doors! What talent can wrap up a reader in such petty squabbles, and then touch with a sense of dreaded urgency as the pettiness falls away in the face of true danger! Every character is bursting with life, his or her own personality, the whole setting is fresh and unforced. It struck me the other day that one of Kendall's characters probably, quite without my knowing it, influenced one of the best characters I've written yet. Huzzah! Yes, Jenny has a thing with C.S. Lewis. You'll get used to it, don't worry. It would also appear that she has an affinity for silver, and that, too, is true. But this is rubbish and bunny-rabbit trails. I will get on with myself. The Silver Chair is such a fun book, especially because of the profound discourses between the children and Aslan. And Jill, who is my favourite English character, makes her debut here. Puddleglum is a brick, and a real hero. Lewis infuses a delightfully medieval atmosphere into this story without weighing it down. Mingling the seriousness of the children's quest with moments of light-hearted fun, Lewis pulled off a wonderful little book here. "But," said Eustace, looking at Aslan. "Hasn't he - er - died?" "Yes," said the Lion in a very quiet voice, almost (Jill thought) as if he were laughing. "He has died. Most people have, you know. Even I have. There are very few who haven't." Again? Jenny! For pete's sake... Yes, again. For the same reason I like Justin and Flavius, I adore Tirian and Jewel and their steadfast love for each other. Not only that, but together they share an unfailing (if sometimes misunderstanding) love for Aslan, and they are willing to fight to the death to preserve the truth. That's the sort of hero that is worth reading about. 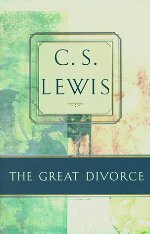 And Lewis, though he brings Narnia to an end, manages to do so without the bitter taste of loss, for he understands that all creation will be made anew by Heaven's breath, and nothing worth keeping in Heaven's eyes will be lost. Then Aslan turned to them and said: "You do not yet look so happy as I mean you to be." Lucy said, "We're so afraid of being sent away, Aslan. And you have sent us back to our own world so often." "No fear of that," said Aslan. "Have you not guessed?" Their hearts leapt, and a wild hope rose within them. "There was a real railway accident," said Aslan softly. "Your father and mother and all of you are - as you used to call it in the Shadowlands - dead. The term is over: the holidays have begun. The dream is ended: this is the morning." And as He spoke, He no longer looked to them like a lion; but the things that began to happen after that were so great and beautiful that I cannot write them. And for us this is the end of all the stories, and we can most truly say that they all lived happily ever after. But for them it was only the beginning of the real story. 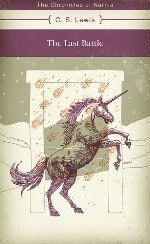 All their life in this world and all their adventures in Narnia had only been the cover and the title page: now at last they were beginning Chapter One of the Great Story which no one on earth has read: which goes on forever: in which every chapter is better than the one before. Adamantine Update + Some Snippets!